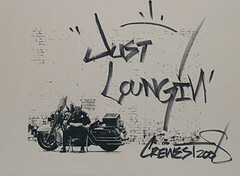 Crewest Gallery News: Just Loungin...opening nite! These are some of the pieces created during our March opening of Just Loungin' last Saturday night. More of a series of events rather than an exhibition, there was live art by Unification Theory (Gustavo Alberto Garcia Vaca, Man One, Overton Loyd) and guests Vyal, Favianna Rodriguez and live printing by the Yo! What Happened to Peace? crew. Andrew Hanson rocked some live sewing. Yeah we said live sewing! Never thought that could be cool, but check out his stuff. Some of these pieces are still available at an incredible $50 each. Join us Thursday, March 13 during the Downtown Artwalk and then again Saturday nite, on the 15th, for The Label Lab. Hit us up for any info..